While we were visiting Sammy’s, my friend asked an employee what makes their “famous” shakes so famous. The response was, “Well, we put an entire slice of pie into every shake and mix it up.” We were sold and both ordered one. Your concern won’t be finding a pieshake that you like; it will be trying to limit yourself to one. From banana cream, pumpkin pie, mint Oreo and chocolate-cream Oreo, to blueberry, cherry, four types of cheesecakes and two types of cobbler, your palate will be delighted and over-stimulated. What a nice problem to have. There are a lot of dessert and shake joints around town that you can go to for your post-dinner cravings; it’s almost an uncontrollable urge. But there are none quite like Sammy’s. Who would have thought to blend a piece of pie into a shake? Whoever it was, I thank you. My diet and exercise routine may not, but it can be our little secret. The minute you take your first spoonful of pieshake, you’re transported to another world. You will forget about your lunch partner and disconnect from the conversation—which you might have been about to do anyway, but this gives you a good excuse. 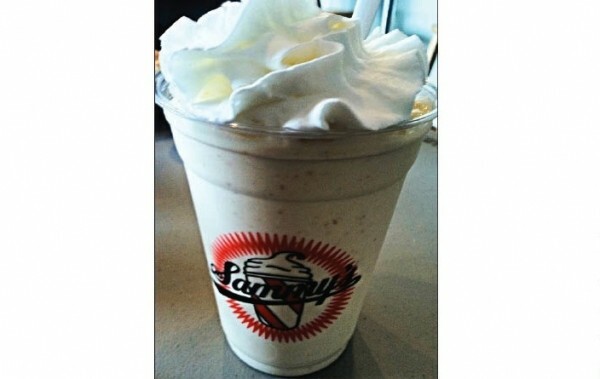 Please don’t limit your meal to a pieshake; you’ll need to chase it with one of Sammy’s delicious burgers and some fries. Might I recommend Sammy’s masterpiece, with sauteed onions, mushrooms, bacon and guacamole? That combination of toppings could make a shoe taste good. But instead of a shoe, they’re loaded onto a 1/3-pound burger covered with provolone cheese on a delicious bun. Remember the fries as the final component to this meal. Go with the battered or sweet-potato fries. All of them are fresh-cut, but these will provide you with an additional level of flavor and excitement. As if you needed one more.